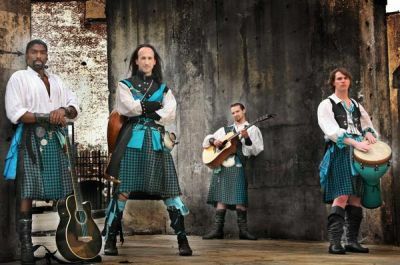 Folks who have been long-time readers of this blog (see Shakespeare With the Lost Boys) know I like the Lost Boys, a “Renaissance rock” group who perform annually at the Georgia Renaissance Festival (and others). Annually, that is, until this year. This popular act has inexplicably not been invited to perform at this year’s faire, despite the fact that they have a core group of fans who dress in teal garb and attend all their shows (no, I don’t do that, but I have all three of their CD’s) and despite the fact that every Lost Boys show I have ever seen was well-attended and appeared to be enjoyed by fans present. I find the decision all the more alarming in light of the fact that Matthew Trautwein, who goes by the moniker String as a member of the Lost Boys, has — I believe — been the musical director for GARF in the past. A visitor named Lea shared this petition with me. If you are a Lost Boys fan (or even if you’re not, but hate to see a popular act be summarily dismissed), consider signing it. seems like an entertaining band. i went to youtube to check out some of their performances. there are some funny ones in there. your Shakespeare post has some great stuff too. hope they get re-signed to do the festival.